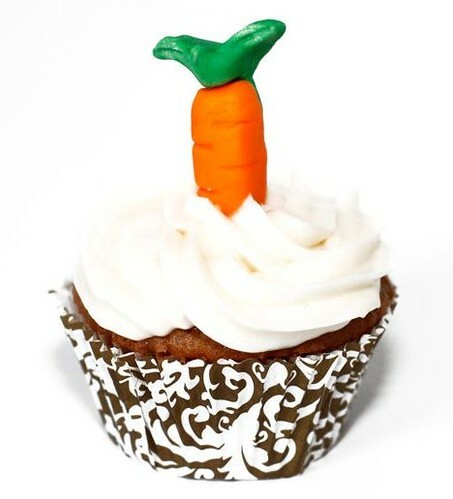 The first time I heard the words “carrot” and “cake” used together, my nose crinkled up so tightly that it would make the Easter Bunny hop away in shame. What half-baked nut decided to pair a vegetable—a noxious, stringy, tasteless plant with a dessert—the food of Gods, and well, my most-frequented food group (doesn't that new food stair/pyramid have dessert as the first and largest stair?). As a child, attending a wedding had one advantage: endless treats. My small frame slumped over in disappointment every time I was forced to attend a reception which served nothing but carrot cake. On such occasions, I supposed the bride and groom were so madly in-love, they managed to overlook that their Grandma or some other rabbit-food eccentric had ordered them a non-cake cake—a cake whose elegance and silver edible balls (newly approved by the FDA) draw the nearly dying sugarmonger to its side, only to stuff her cheeks full of CHUNKY VEGETABLES! Shock, terror, disappointment, and rabid anger are a few of the initial feelings I would use to describe such an experience; yes sadly, I have been a first-hand victim. Perhaps it's my maturity and life experience, maybe even my taste buds dying off from taking too many first bites of steaming-hot DiGiorno pizza right out of the oven; call me a rabbit-food-eating Grandma if you wish, I now love carrot cake. This recipe is for a fairly easy, and veeery moist and tasty carrot cake with cream cheese frosting. I'm going to build up my ego and say that I make a much better carrot cake than the ones I tasted as a child, because children run up to me on the street begging for one when I'm out delivering them to friends. They do not cry and spit them out, they ask for more. 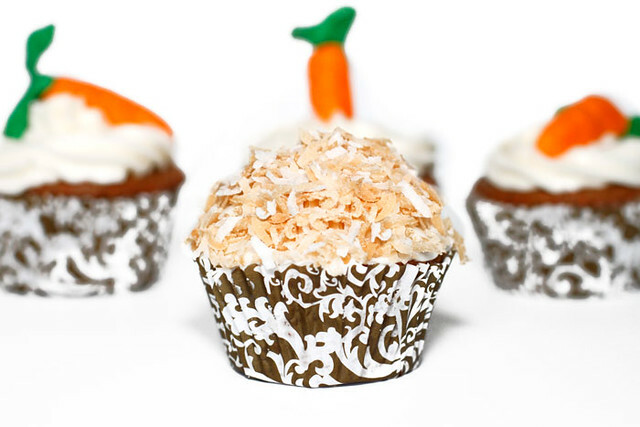 Yes, they are that good, especially the mini-cupcake size—perfect for the tiniest of chubby hands, and even better for adults who know they need at least 3 of some kind of dessert, whatever it may be—plus, the carrots help us rationalize eating more. A perfect Easter tradition, this recipe can make a fantastic carrot cake for Easter dinner (pour evenly into 2 8” or 9” circle pans, or a 9x13” pan), regular sized cupcakes, or many minis (fill cupcake tins about 2/3 full). In a few hops, these will be out of the oven and into happy mouths! 1. Preheat oven to 350 degrees F. Grease and flour a 9x13 inch pan, 2 circle cake pans, or prepare cupcake tins. 3. For a cake, bake in the preheated oven for 40 to 50 minutes, or until a toothpick inserted into the center of the cake comes out clean. 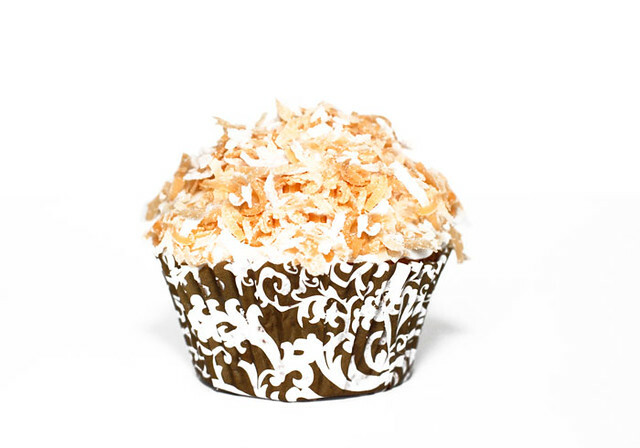 Cupcakes will need significantly less time, so keep an eye on them (probably 10-15 minutes depending on whether you make minis or regular-sized). 4. To Make Frosting: In a medium bowl, combine butter, cream cheese, confectioners' sugar and 1 teaspoon vanilla. Beat until the mixture is smooth and creamy. Stir in chopped pecans if desired. Frost the cooled cake. I tried this recipe last night and yummers! My kids ate every bite even tho they dont like carrots. Thanks you for posting!